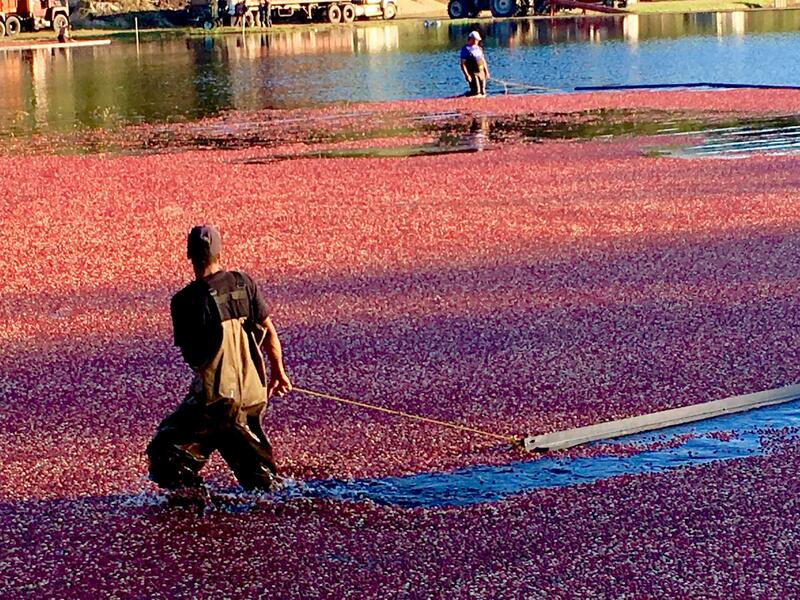 Workers harvest cranberries in East Falmouth, Mass. Cranberries are a billion-dollar industry in Massachusetts and employ more than 6,900 people. But the market is getting crowded, and that’s pushing down the price. Wisconsin has been the top grower in North America for years, where cranberry farms go back to the 1800’s. Quebec has only been growing cranberries for the last 20 years, but it surpassed Massachusetts in its cranberry harvest in 2014. Why hasn’t Massachusetts kept up with the Wisconsin and Quebec? “It’s not so much that our production is down, it's that it's stable, and other areas are growing,” according to Carolyn DeMoranville, the director of the Cranberry Experiment Station in Wareham. The station, which is part of Umass Amherst, was founded in 1910. Massachusetts cranberry farmers paid a penny for each barrel they produced. The money was used to hire a horticulturist. DeMoranville says one reason that production has taken off in Quebec and Wisconsin is that those farmers are growing modern hybrid plants that produce more cranberries. “In Wisconsin, the so-called heirloom, or original cultivar cranberries, make up only 7 percent of their acreage; in Massachusetts we have about 50 percent in heirloom varieties,” she said. There are benefits to growing heirloom cranberries. For one thing, the hybrid cranberries can be so big, they start to resemble cherries. It’s not what some customers are looking for. The reason that so many regions got into the cranberry business is that the price of cranberries went sky-high in the 1980s with the advent of cranberry juice blends. Prices came back down as more farms planted cranberries. Then, in the 1990s, the industry invented dried, sweetened cranberries (Craisins). The price went back up. Even more farms started growing cranberries. "There was a shortage of cranberries and that encouraged a lot of people to plant," says DeMoranville. "They somewhat overshot the mark." Other than price, the biggest challenge of the future for Massachusetts growers will be water, says DeMoranville. "Water quality, water quantity, and preserving water quality," are big issues, she said. "And then pest management is always with us as we try to find more and more safe ways to manage pests." Cranberry harvesting in East Falmouth. There are many recipes out there, this is the basic one. In a heavy saucepan, bring cranberries and water to a boil and simmer until the berries pop, about 10-12 minutes. Stir in sugar and let cool. Store refrigerated. Adjust sugar to your taste or try brown sugar or honey. Replace some or all of the water with orange juice. Try adding a pinch of cinnamon or cardamom.